A single light illuminates a room Nov. 24, 2015, during a blackout at a residential building in Simferopol, Crimea. Crimea continued to rely on emergency generators to meet its basic power needs. The Ukrainian government has denied the accusation as "absolutely groundless." Ukraine also said that it intends to block food shipments to Crimea as reprisal for Moscow's ban on imports of Ukrainian food to Russia. 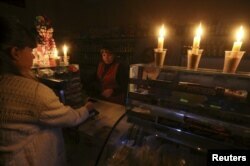 FILE - A customer visits a grocery lit with candles Nov. 22, 2015, due to a power cut, in Simferopol, Crimea. He also said that the Kremlin may halt coal supplies to Ukraine in retaliation for blowing up pylons that caused the interruption of gas supplies from Ukraine, which accounts for most of Crimea's electricity. Weeks later, pro-Russian separatists in eastern Ukraine launched a rebellion against Kyiv's rule that triggered a series of trade and travel sanctions against key Russian officials close to President Vladimir Putin. Those sanctions are due to expire in January.